I thought it might be nice to show a typical pencil sketch, to help explain the design process that goes into my Bible Cartoons. 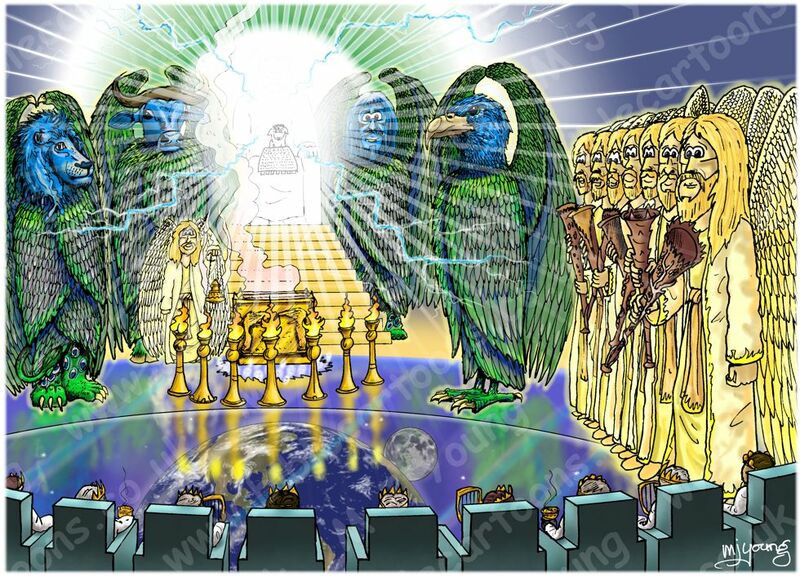 In my last BC Blog post I explained I’ve been asked to draw a few scenes from Revelation, which is the last book of the Bible. A lady in Texas, North America has asked for several scenes from Revelation chapters 7 and 8. 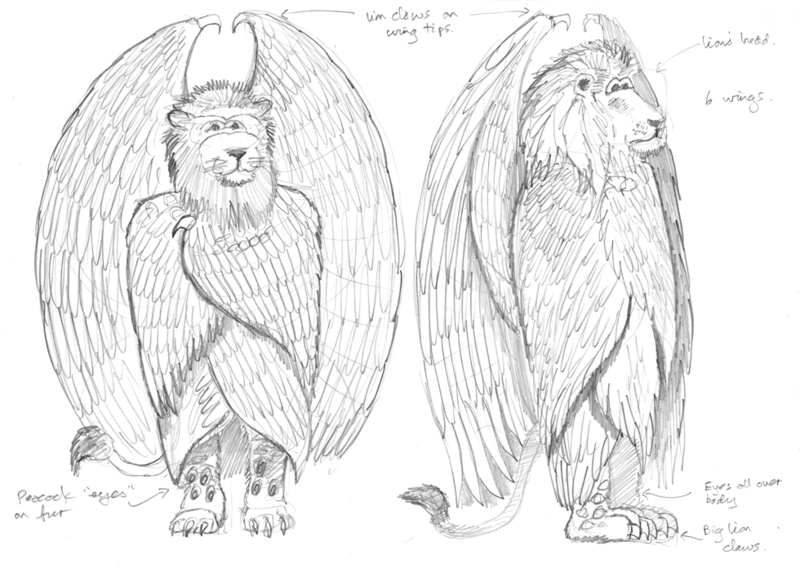 The sketch above shows how I design beings that we have not seen before, like the lion-headed living creature from Revelation 8. I get an image in my imagination, and then try to get that down on the page using pencil, which allows for much alteration and changes of mind.. when I’m drawing such an unusual being, there’s a lot of that! I wanted the 4 living creatures to look big, and imposing, but not necessarily scary, hence their rather impassive expressions in the finished picture. I designed the feathers on the 3 pairs of wings using reference to eagle’s wings, with small ones close to the body, and longer ones near the tips of the wings. As you can see from the image above, I like to add written notes to these rough pencil sketches, to remind myself of import features to include in the finished design. In the case of the four living creatures, I decided to have 2 pairs of its wings wrapped around the body, with the 3rd pair outstretched behind it, which looks pretty dramatic and imposing! 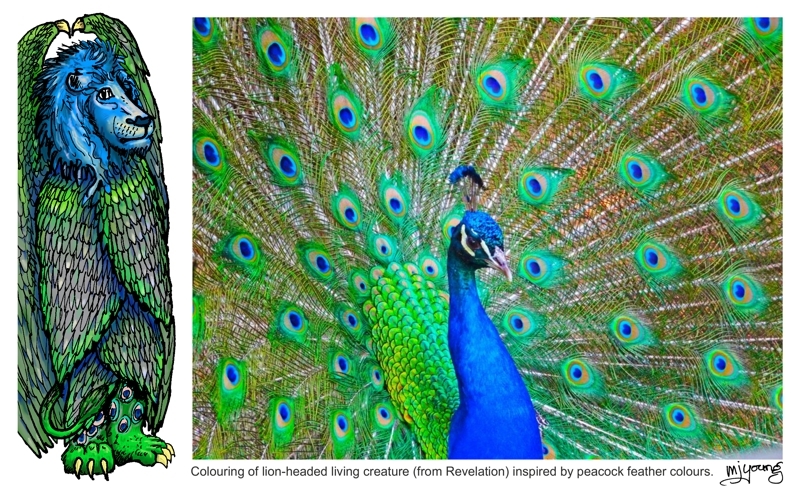 As you can see from the above image, I decided to make the “eyes” on the fur/skin of the living creatures look like those you see on the tail feathers of a Peacock. I often draw in pencil to get ideas down on paper, before moving to the final pencil sketch of the scene I have in mind. I then ink that final scene in, scan into my computer, and make any changes that seem appropriate. Often I feel the need to alter facial expressions, or alter other minor aspects of the inked drawing. After that, I apply flat colouring to the scene, then the shadows and highlights, that create the 3D like qualities of the finished picture. The picture below shows the full colour, finished scene, with the living creatures present.